According to a recent study undertaken by Harvard based researchers, the benefits of green buildings far exceed than just that of reduced energy usage. Buildings consume nearly 40% of primary energy production around the world. Any cuts in energy consumption can have a tremendous impact on carbon emissions which is the main source of climate change. Moreover, green buildings give rise to many other benefits related to employee and occupant health and well-being. The research team quantified these associated social and benefits in billions of dollars. However, The UAE is changing due to visionary and proactive work by the government. It is now one of the standard bearers of environmental sustainability not only in the region but globally. The government has been consistent in its focus on achieving sustainable development goals as can be seen in the Dubai Integrated Energy Strategy, A green Economy for Sustainable Development in line with the UAE vision 2021, the Dubai Clean Energy Strategy 2050 and the UAE Energy Plan for 2050. As highlighted in previous posts, sustainability or “green building” is one of the dominant trends in the UAE real estate market. The drive towards sustainable design and construction is coming both from government initiatives as well as the private sector. The real estate market has responded to these government directions as well as to green building regulations in the UAE including Abu Dhabi’s Estidama Pearl Rating System, the Dubai Green Building Regulations and Dubai’s Al Safaat system by focusing on improving the environmental performance of new and existing structures, and integrating sustainable fit out principles. The demand for green commercial properties now exceed supply according to the recent Sustainability and Wellness report by Core Savills. According to the report, the UAE is now among the top 10 countries holding the Leadership in Energy and Environment Design certifications outside the US. Moreover, Dubai is the third among the cities with the highest number of green buildings with both LEED and BREEM certifications. By the end of 2017, Dubai had more than 550 projects undergoing LEED certification. Increasingly, companies are including sustainability within their corporate real estate framework because the benefits of “green” thinking are becoming ever more obvious, in terms of increased employee productivity and well-being, as well as reduced operating costs. Improving productivity, performance and profits. In creating an innovative sustainable commercial fit out, the focus is always on creating a healthy and safe environment. Several elements must be brought into play, starting with designing flexible work areas and leisure spaces, managing temperatures and air quality, ensuring efficient use of energy and water and putting in place waste disposal methods. 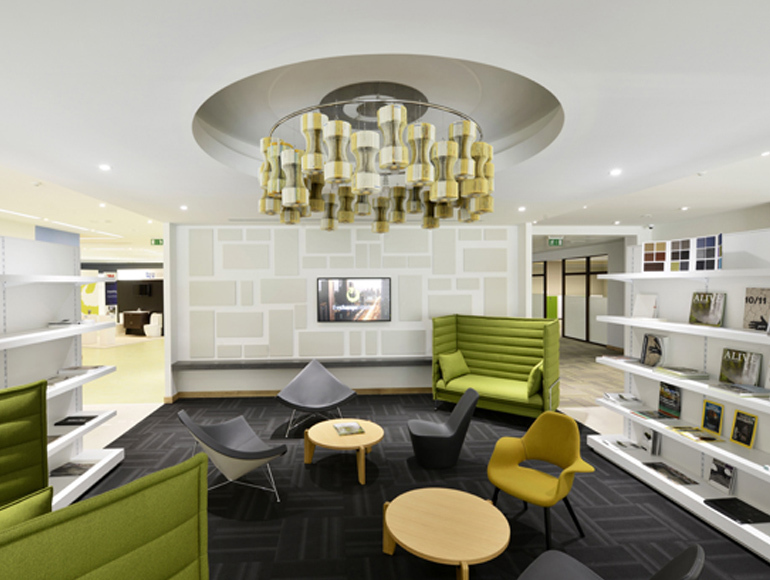 One of the first steps in ensuring a green office fit out is the selection of the materials to be used. Although there is often a focus on using natural and locally sourced resources, technology also has a role to play here. There are increasing numbers of artificial materials that are more environmentally safe than traditional building materials. For example, since 2015, Dubai Municipality has required the use of sustainable “green” concrete in all new construction. This concrete, according to The Big 5’s Green Building White Paper, uses environmentally friendly materials characterised by low-energy costs, high durability and low-maintenance requirements, and contains a large proportion of recycled or recyclable materials. Dubai municipality promotes the use of eco-friendly Supplementary Cementing Materials (SMC) to replace ordinary cement. Another trend in materials is the increasing use of carbon fibre rather than steel. Carbon fibre is around 90% lighter than steel, making it a greener alternative. Amritha Achuthan and Mohammed Dulaimi In their Paper “Implementing Green Design Initiatives in the UAE” observed that the UAE has one of the highest global water consumption levels because of the climate coupled with the high standard of living. Plus, it must be stressed that the UAE has no natural supply of fresh water and much of the potable water is supplied through expensive and complex desalination. They argue that careful use of available water and its reuse and harvesting is imperative. The UAE is also moving toward the re-use of grey water. Dubai Municipality is working with the Dubai Electricity Water Authority (DEWA) to distribute treated sewage effluent for non-potable activities, such as toilet flushing, car washing, etc. 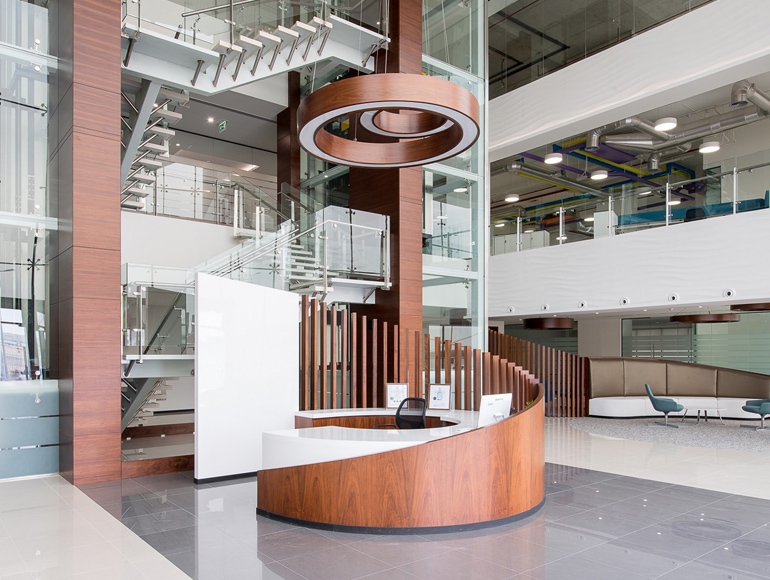 Another important feature of sustainable interior fit out is the use of energy efficient technology to cut energy costs while improving the office environment. Zoned energy controls to manage low usage or low occupancy areas separately. A vital method of encouraging sustainability is to provide access to sustainable travel modes, such as public transportation or bike paths as well as facilities for electric vehicles. The UAE is actively encouraging motorists to switch to electric cars to support its ambitions, environmental goals and to cut carbon emissions. “Incentives for Using Electric Vehicles” is a new federal platform with the objective of replacing 10% of the federal government’s car fleet with electric vehicles. New green insurance plans and green bank loans are also in the works. In Dubai, electric vehicle owners will enjoy special incentives including charging for free at Dewa approved stations until 2019, using free designated green parking spots and receiving free electric vehicle registration and renewal fees. 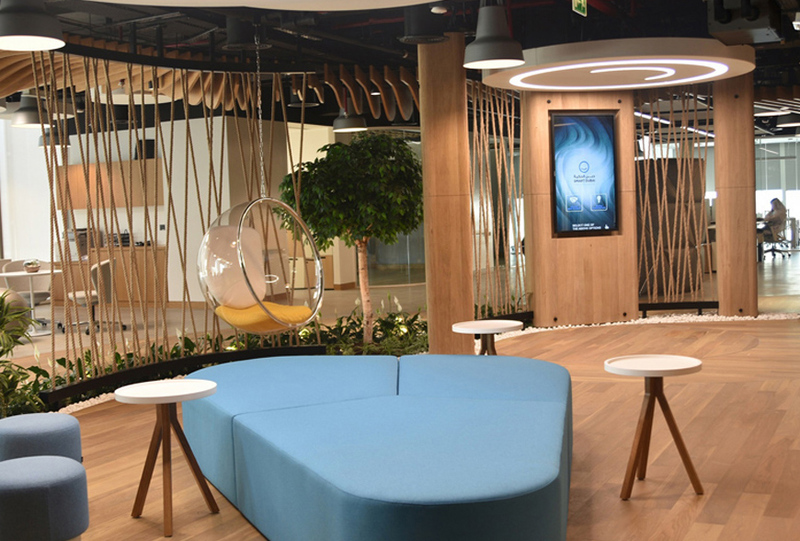 Recently, Summertown Interiors installed an electric charging station for electric and hybrid vehicles at its Dubai headquarters, which can be used for free by all employees or visitors. Developing methods for on-site energy generation such as solar cells is becoming very popular. In the UAE, some companies such as MASDAR are already using PVCs (Photovoltaic cells) to generate electricity. It needs to be pointed out however that while the UAE may seem like the ideal location for using solar cells, in practice, the high levels of humidity and ambient dust, mean that maintaining PVC efficient operation can be costly. Only 14% of waste in the UAE is being recycled, but the country has a target of 75% of waste reclamation by 2021. To support this ambitious goal, any new office fit out or re-fit requires a waste management plan during works. 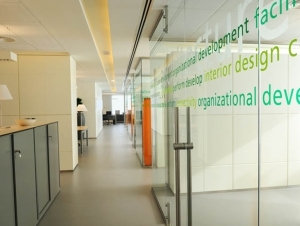 The sustainable office fit out consultant should also help the client in integrating the office waste practices into the waste management system of the overall building. This can involve waste separation at the source to encourage recycling as well as recommendations for waste transport provisions. It is worth noting that there is no safe level of internal pollution, as even minor levels of pollution can be harmful to the health, especially with prolonged exposure. Noting that in economically advanced countries such as the UAE, people can spend up to 90% of their time indoors. Fresh air is extremely important and is one of the main elements that can be used to flush out contaminants. In fact, Dubai Municipality Green Building Regulations require all new buildings to make provisions for opening windows, unless there is a valid security reason to prevent this. Creating separate spaces for high emission office equipment. Thermal comfort is the term used to describe the subjective satisfaction with the thermal environment. It’s a rather complicated way of saying the level of employee satisfaction with the surrounding office temperature. Maintaining a satisfactory level of thermal comfort is one of the most important duties of a good office refit. Most people feel comfortable at room temperature around 20 to 22 °C but many other factors are involved in thermal comfort including gender, age, clothing, humidity and activity level. A recent study undertaken in Abu Dhabi found that many people found their buildings’ temperature was too cold. Responding to the study’s initial findings, one company changed its floor seating plan. The floor was unevenly cooled, so employees were given the option of switching to cooler or warmer areas according to their preference. Integrating the latest technologies into an office fit-out can have a measurable impact on employee engagement, productivity and outlook. 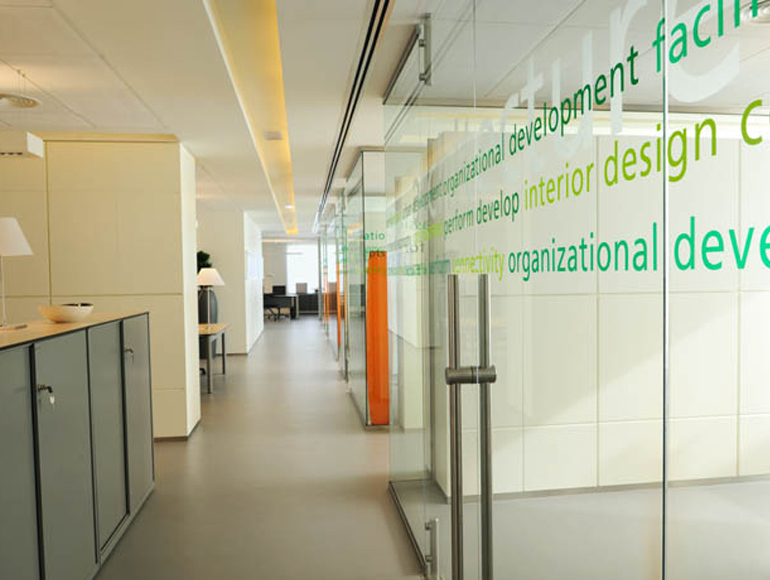 Green Fit out is a process that begins with design, selection of the appropriate materials, implementation, and finally hand-over to the client. The final stage is operation and maintenance. In previous posts, we have emphasised that by moving to a sustainable office fit out has a direct positive environmental impact by reducing carbon emissions and regulating the use of vital natural resources like energy and water. Following a holistic or comprehensive approach in office design, integrating technology, natural air and light, introducing plants and greenery can also have a measurable effect on employee well-being, increasing productivity and ultimately reducing costs and increasing profitability. A green office is a happier office; and a happier office delivers productivity.